Children should have access to entertaining as well as educational fiction and non-fiction. In ROV-R, The Undersea Explorer “The Bimini Road,” Kevin Scott Collier has done just that. The undersea exploration story of the Bimini Road is told through the eyes of R.O.V.-R., Remote Operated Vehicle, Model R - or "Robert," as he thinks is his name. It is presented as an adventure and a mystery. Kids will get caught up in the adventure and learn more about this great mechanical device that aids in undersea exploration. 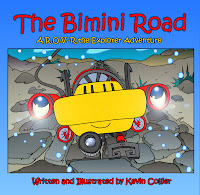 ROV-R narrates the Bimini Road exploration with excitement and enough facts to give kids something to chew on in this mystery/adventure. What will ROV-R find? Is the Bimini Road manmade or something from nature? We’re anxious find out. We see what ROV-R sees through his camera “eye” and the information is then digitally transmitted to his on-board partner, Dave. Perhaps Dave and the crew can analyze the images and data ROV-R provides to figure out what made the Bimini Road, man or nature. R.O.V. – R. is a fun adventure story for kids to enjoy and learn about undersea exploration. Kevin Collier's illustrations are realistic enough to educate and fanciful enough to entertain. This story will do well in school classrooms and libraries. I look forward to more fun science adventures about ROV-R from Kevin Collier. The cover reminds me of Magic School Bus. I would think he would have a big audience with people who enjoy those books--I used those all the time when I taught elementary school! :) Thanks for sharing. HI Margo, thanks for the nice comments. There are three more ROV-R" adventures" and I will be reviewing them later this week and next! If you go to their website you'll see videos, too.